RANGOON—On the road to Mandalay, the Burmese military intelligence men and their thugs kicked him, beat him, put a hood over his head and threw him into a waiting truck. It was on Nov. 4, 2007, more than a month after the government's bloody crackdown on peacefully protesting Buddhist monks who staged Burma's largest anti-regime demonstrations in nearly two decades. “There were around 100 of them, on motorcycles and in trucks. They blocked the road and grabbed me. Hours later, I found myself in an army camp on the outskirts of Mandalay, and all hell broke loose,” said the 33-year-old Buddhist cleric, putting a betel quid into his mouth while lying on a mat at a monastery in Thingangyun Township in Rangoon. U Gambira was one of the 302 political prisoners set free by the nominally civilian Burmese government's latest amnesty this month, after serving more than four years of a 68-year sentence in Myaungmya Prison. He had been charged with 17 offenses, including a violation of Burma's draconian Electronics Act. He comes from a family with a political background—his father and brother had served long prison sentences for their involvement in the 1988 nationwide pro-democracy uprising. He has also been a victim of crimes committed by Burma's military. According to the Thailand-based Assistance Association for Political Prisoners, he was forcibly recruited as a child soldier at the age of 12. But the native of Pauk, a provincial town 75 km from Pakokku—the town in Magway Division where the Saffron Revolution first began to take shape before spreading to larger urban centers—was reluctant to talk about the bitter past. “I just want to focus on present and future,” said the monk. He was 28 years old when he was arrested in 2007 for his active involvement in the Saffron Revolution, which was organized by Buddhist monks who took to the streets to protest a sharp rise in fuel prices that deepened the economic hardships of ordinary Burmese. In Burma, where more than 90 percent of the people are Buddhists, monks are not only highly regarded as guardians of the faith, but are also involved in many aspects of everyday life, providing spiritual guidance and pivotal social mediation. In return, monks depend on community support for their day-to-day survival. During their daily alms rounds, they can see with their own eyes just how difficult life is for the average person in Burma. “Hardship is written all over people's faces. They are preoccupied with finding ways to make ends meet. They often apologize to us because they were unable to make offerings,” said Maggin Sayadaw, the abbot of the Maggin Monastery in Rangoon's Thingangyun Township, who was also arrested for his role in the Saffron Revolution and released on Jan. 13. Although people's discontent with the government's economic mismanagement was deepening, they had no way to express their dissatisfaction, because they feared any attempt to protest publicly would be violently crushed by the army. “That's why we had to step in,” said Maggin Sayadaw. This brewing collective anger finally came to a head in Pakokku on Sept. 5, 2007, when several hundred monks staged a peaceful demonstration against soaring commodity prices. Instead of listening the the monks' demands on behalf of the people, the authorities came down hard on the protesters, sparking outrage elsewhere in the country. All over Burma, in a dramatic act of excommunication, monks started refusing alms from anyone with military ties and walked barefoot through the streets chanting the Metta Sutta, the Buddha's discourse on loving-kindness. The Saffron Revolution was born. 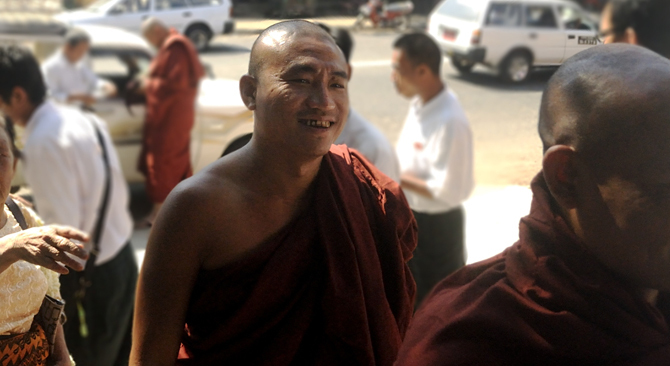 During the revolution, U Gambira was an information officer for the All-Burma Monks Alliance, a leading organization made up of eight monks' unions. “We tried to banish the military dictatorship from Burmese soil,” he said. But on Nov. 4, he was thrown into a 10' x 10' room at an army camp outside Mandalay to be interrogated for the next six days. “I was bombarded with endless questions the whole day and the whole night on who we were or what we did. Thank you so much for the love you have shown! It is great to see U Gambira free. He is an inspiration, as he continues to work and live to serve others. The courage of the Burmese people is remarkable and a powerful lesson to all "leaders" who fail to listen to the voice of the people. Whether it's fear of economic ruin, or the realisation of the inevitable karmic justice, I do not know, but I hope the eyes of the world will this time not flinch, and will ensure there is no relapse into violence by the army and police. Long live Daw Suu Kyi and U Gambira. Patient unreasonably is a sin. Fighting the Satanic rulers is a grace and heavenly deeds. U Gambira is a courageous man, whose name resonates around the world. He is listened to. Monks can be political teachers when the people are suffering. Generals in new clothes are not a 'government' in anyone' terms. The game is up.